Stumped on what to to do for your wife or girlfriend for Valentine's Day? Use these frugal ideas to show her how much you love her this Valentine's Day. This is a guide about Valentine's Day tips for men. In the soul of every woman, there is the desire for her man to do something wonderful and unexpected for Valentine's Day. Every woman wants romance and something magical for this special day so here are some quick tips on how to make this the best Valentine's Day ever. First, if you don't know what she would like, ask her mother! Moms always know the best ways to please their daughters. Ask her best friends. Now if that gets you nowhere, refer to this article. She would love two hours to herself to do what ever she would like to do with you, but without the kids. She would love it if you helped the kids bake a cake or cupcakes and treated her like the queen she is. Decorate with chocolate hearts. She would love to have you draw her bath, with candles and bubble bath and a CD of romantic music and let her soak while you take the kids somewhere else. She would love a back rub and some loving. She would love a single rose and a foot - rub. She would love to have you make dinner. Ask your mother for help with recipes and cooking instructions. She would love a love letter or for you to dedicate a special song just to her. If you can sing, sing it to her. She would love for you to snuggle up with her and watch "Chick Flicks" and not complain. She would love for you to buy her a favorite movie or book. Google poetry and read it to her or write her something special. It does not have to rhyme and it is something she will always treasure. She would love a night alone with you. Plan on a babysitter and her favorite food for a picnic in front of a fire or just on the floor with romantic music playing. Place a tablecloth on the floor (Don't use the one she just bought for Christmas but a nice one) and set it with the good dishes, order out and serve her dinner. Change the wall paper on her computer and put on something romantic or the screensaver that lets you write a message and tell her how much you adore her. Take a walk with her and remember where you first were together. Try and recreate the snowball fight or the snowman or snow angels you made that first winter you were together. Leave love notes in her car, in the bedroom, on the dresser, in the refrigerator, on the coffee pot, in her lunch box, in her briefcase on the bathroom mirror that say "I love you" or the corny sayings off a box of Valentine hearts from the local grocery. 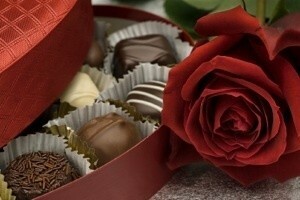 She would love a vase full of chocolates with one rose stuck in the center. It doesn't even have to be real, you can even get her a silk flower she can keep forever. Run a ribbon from her bed to a gift that you have bought her so that she has to follow the ribbon to find her gift. She would love her favorite breakfast in bed. IM or Text message her at work with how grateful you are that she is yours and then have lunch delivered to her office. Get dressed up and meet her for dessert at her favorite spot. Slow dance with her after dinner even if you have two left feet. She will love you even more for the effort. 88 cents at Walmart should buy you enough silk roses that you can cut them apart for the petals and spread them all over her bed, spray her sheets with her favorite perfume and light some candles. Set the mood for love with love songs playing and show her how much she means to you! Make a big sign for your SUV and attach it to the front of the grill like you would do with a wreath that says "I love you Honey" or "You are my best girl." I hope this inspires you to do something extra special and maybe spark some ideas of your own. 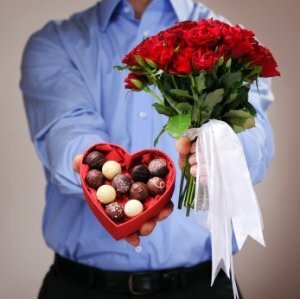 Flowers are mandatory since you know if you buy her chocolates, you will be eating them so that does not count. Awww why thank you Debra, what a thoughtful and heart-warming list of Valentine's day ideas! I would absolutely melt to have any of those happen to me on the 14th!! On the big day (for me) nothing is better than a warm, intimate dinner at home (as laid back as possible, in my opinion!) I just believe that it is so very, very important to have a day where you focus on your loved one and letting them know how much they mean to you. I just so happen to have the inside scoop on a fantastic contest about love and expressing love going on right now that you guys should definitely take a quick peek at sometime; I work for Dove Chocolates (perfect for this time of year, huh? haha) and we have this contest going on right now called the "Expressions of Love" contest, where we're basically asking people to submit their most creative ideas for letting someone know you love them...and get this, the winner will receive a 5.58cts "Baby's Breath" diamond necklace worth $21,000! !